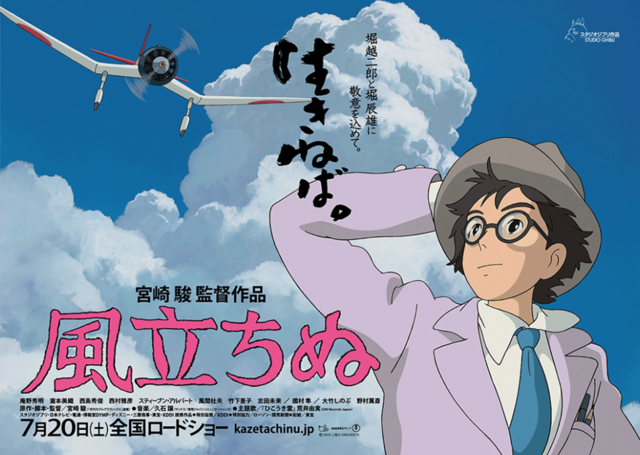 So why would Hayao Miyazaki, one of Japan’s greatest directors, chose to make his final movie about an obscure aircraft designer? He has said that “The Wind Rises” will be his last, and he’s already 73. None of his other movies have been based on real people, so why make one about Jiro Horikoshi, the designer of the Zero fighter plane of WW 2? There are very few movies of any kind about engineers, and this animated one is unique. It might be just because Miyazaki loves flying. It features in a lot of his movies, especially “Laputa, Castle in the Sky”, which has air pirates and an entire flying island. Flying is an inherently beautiful thing, and his style of cel animation is wonderful at portraying it on film. But I think something else is going on here. The Zero was the first Japanese industrial product that was clearly competitive with the West. In the air battles of 1941 and 1942, it shot down everything that the US and British could put against it. Compared to the standard US Navy fighter of 1941, the Brewster Buffalo, it was faster (330 mph vs 320), more maneuverable (a rate of climb of 3100 ft/min vs 2440) and had longer range (1900 miles vs 965). Japan had been trying to catch up ever since the Meiji Restoration. Once they were forced by Admiral Perry to look beyond their shores, they could see how far behind they had gotten. Even by the time of this movie, the 1930s, the country still looked pre-industrial. The movie is filled with pretty scenes of fields and small villages. At the Mitsubishi aircraft factory where Horikoshi is working, they still haul the planes out to grassy runways with teams of oxen. But things are changing. The men are now wearing suits and ties. Rackety cars are moving down the streets. The air itself is in trouble – Horikoshi’s wife Naoko suffers from TB, and cannot stand the polluted air of the cities. Flying itself gives a freedom to the Japanese that they had never known before. Horikoshi exemplifies what it took to catch up – he’s a person of Zen-like concentration and utter determination. It all ends badly, of course. Naoko risks her health to be near him when he’s doing the flight trials of his first masterpiece, the A5M, but realizes that she is keeping him from work critical to the nation. She flees back to a sanitarium in the mountains. Just as the plane has its first spectacular flight, he feels a puff of wind and knows she is gone. The movie ends at the end of WW 2, with Horikoshi looking out over vast fields of wrecked aircraft and saying “Not one of them came back.” And it’s true – of the 11,000 Zeros built, only 1 flyable one remains. His boyhood dreams of freedom and flight ended in ruin for him and his nation. So this isn’t just a story of an artist who worked in metal and engines instead of animation cels. It’s not just a tragic love story. I think it’s also a story of the country itself. No wonder it was the highest grossing movie in Japan in 2013! This entry was posted in Uncategorized and tagged movie-ish, tech-history. Bookmark the permalink.